The only thing that’s better than the smell of freshly baked pie is the smell of eighty freshly baked pies. If you can see, smell, and eat one pie and describe that experience as great, orgasmic, heavenly, etc, then what are the words you would use to describe being able to see, smell, and eat eighty pies? I’m asking you because I really don’t have the words, but I do have the experience. Ken and I hosted our most delicious event, Pie Party Potluck LIVE!, for the fourth year on October 3rd, 2015. It was held at the new campus of the Institute of Culinary Education (ICE) in Brookfield Place. The concept is simple. Food bloggers and food professionals all make and bring pies and we eat as much as we possibly can. We pack up the leftovers and take them home and continue to eat pie as long as our pie stash lasts. I made two pies, one savory and one sweet for pie party. I’d spent most of the week leading up to Pie Party Potluck LIVE! in Idaho. 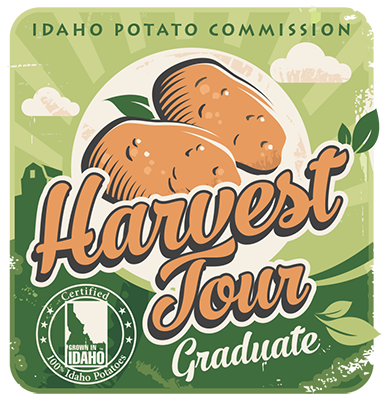 I was on a whirlwind potato harvest tour with the Idaho Potato Commission. I now know a lot more about the growing, harvesting, storage and processing of potatoes than I ever thought I would. 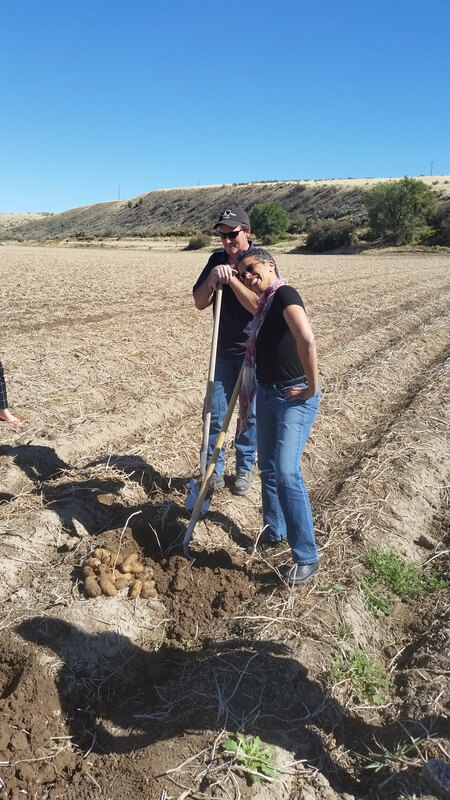 We visited James Hoff Farm where I dug potatoes and had a delicious dinner with the Hoff family. We visited Lamb Weston where millions and millions of pounds potatoes are fried and frozen for companies like McDonalds, Wendys, etc. At James Tiede’s Farm, I learned that the squillions of potatoes they store in the fall will be held in these giant storage houses until May. Idaho potatoes have staying power. We went to Wada Farms where they sort and bag many sizes and varieties of potatoes for various brands. Some of the potatoes sold at Walmart are even bagged in packaging made from potatoes. We visited the Idaho Potato Museum which has some interesting and unusual exhibits like what must be the largest collections of potato peelers and mashers and a life-sized Marilyn Monroe in a potato sack—she ROCKS the sack (In the video below you can see me hanging with her at the museum and singing about potatoes)—as well as photos and machinery from the annals of potato history. You can also buy many themed Mr. Potato Heads in the gift shop. I didn’t know that the original Mr. Potato Head was just the eyes, nose, mouth, etc. and you used a real potato for the body! I was fascinated by the visit to the Idahoan dehydration and processing plant. We couldn’t bring cameras, but we toured the plant where they sort, wash, peel, cook, mash potatoes in a dehydration system that turns out these gigantic sheets of potato paper that are used to make over 4,000 products including countless types of instant mashed potatoes. I’m definitely a fresh potato fan, but I would love to be able to buy the sheets of dehydrated potatoes without anything added. I could have fun in the kitchen playing with them. We stopped at Craters Of The Moon, a dormant lava field in central Idaho and got to wander in the volcanic wonderland. The super glam part of the trip was staying at the Sun Valley resort and having a sumptuous dinner prepared by their chefs in a cabin in the most stunning Idaho fall setting of flaming autumn foliage. We did shots of huckleberry flavored potato vodka at the spot where Ernest Hemingway died. The next and final morning, I even ordered potatoes with my breakfast. You can see photos from the trip on my Instagram feed. I was a HUGE FAN of potatoes leading up to the tour, so I was content to eat them all day for four days and then come back to New York City with one day to spare and make a Carnitas Pie with a potato crust. Digging up my first russet Burbank potatoes and brushing the rich, brown, Idaho soil off them with my bare hands didn’t influence my choice of crust. I’d made a potato roesti crust for the last pie party because I like to make gluten-free pies for Pie Party. It encourages people with food considerations to attend the event. Tater love aside, what inspired this pie was my boyfriend, Paul, being on the Whole 30 food plan. It’s not a diet, but a plan where you eliminate all the foods that cause inflammation and stress in your body for 30 days. No white foods, grains, legumes, dairy, soy products, etc. No sugar, honey or sugar substitutes. It’s very strict. The idea is to take away everything and see how your body reacts to being clean. Then, you add things back in and see how your body reacts.There are no desserts allowed. You can eat some fruits and a small amount of dried fruit. My Whole 30 pie for Paul had to be savory. The trick to the Whole 30 is to eat enough of what you can eat — fruit, vegetables, eggs, meat, poultry, fish, etc. — so you’re not hungry. I made a very filling Carnitas Pie for Paul. It had a potato crust layered with pork carnitas, caramelized onions, roasted carrots, roasted radishes, garlicky roasted tomatoes, and eggs. It was a big hit, not only with him, but with the other attendees at the event. The recipe follows.Pie Party Potluck LIVE! doesn’t happen without the enthusiastic food bloggers and food professionals who bring themselves and their best pies to the event. Our tri-state food community is amazing! Ken captured many photos of them and the scene in his recap. The event buzzes fueled by the love of pie and the air is filled with all the requisite food love sounds: “Mmmms”, “Ahhhs”, and “Yums”. There’s always lots of hugs at Pie Party Potluck LIVE!. Is it seeing old friends that inspire all the hugs… Or is it that the guests see all the pies, don’t believe it’s real, figure out they’re not dreaming and get so filled with emotion they ask random people to hold them? 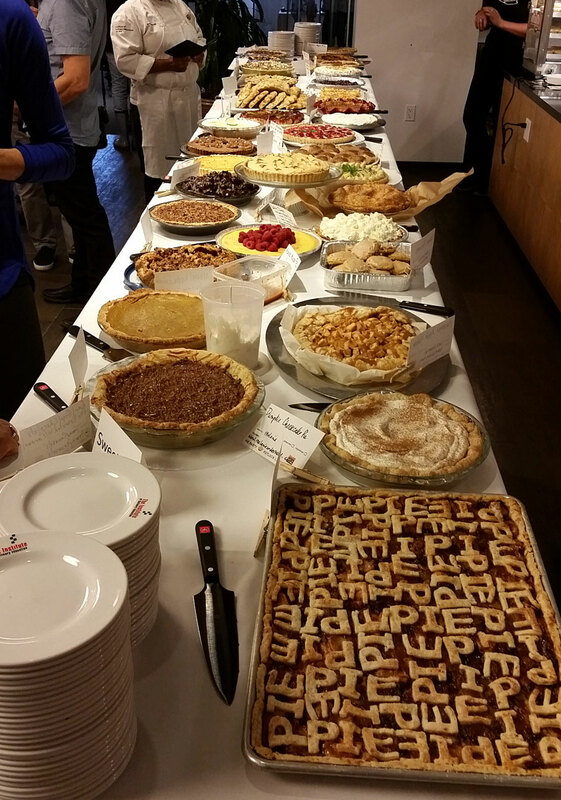 Attendees make both savory and sweet pies for the event. In the past, there’s been double the number of sweet pies to savory pies. 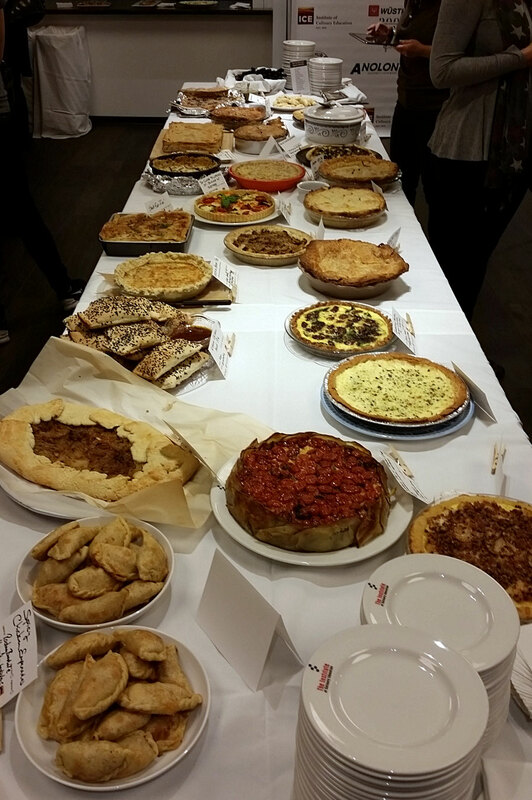 This year, we had as many savory pies and sweet pies. It may have been because Cabot Cheese, being a sponsor, provided cheese beforehand to a number of the guests to make their pies or due to the fact that the event was in the fall instead of spring and hearty pies go with the cool weather. In addition to my Carnitas pie, there were short rib pie, Peking duck pie, oxtail pie, Gruyere cauliflower pie, Piggy pot pie, several tomato pies, chicken curry pie, leek and bacon pie, and many more. On the sweet side, I made a version of my Cupboard Harvest Pie as a slab pie. It has a thick filling of apples cooked down with apricots, cranberries, golden raisins, and currants. 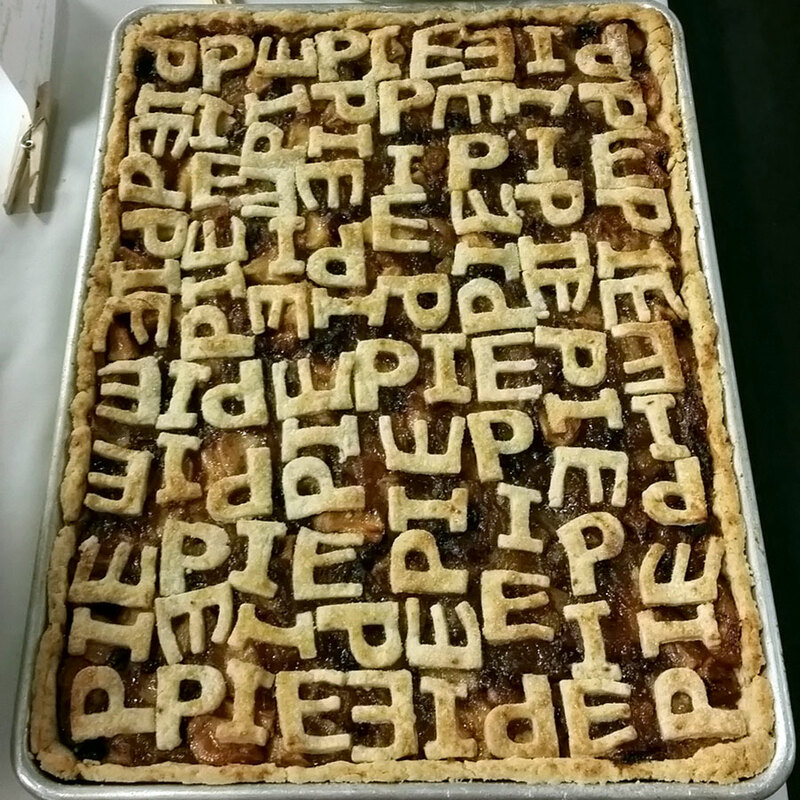 I had fun with the lattice crust and wrote “PIE” all over the top of it. That was a hit too. A number of people said I should go into the “Pie-sonalized Pie” business, so I smacked them. No more new business ideas for Jackie! Ken made a delicious Mississippi “Hazelmud” Pie and a Mont Blanc Tart. Many of the pies on the sweet side followed themes. There were apple pies: Caramel Apple Galette, Apple Pie, Baked Brie Apple Pie, and Jersey Girl Apple Pie. Even Trevor, our youngest volunteer made Apple Hand Pies. Coconut was a very popular flavor in the scheme of pies too: Fresh Coconut Tart, Buko-Coconut Custard Tarts, and Chocolate Coconut Banoffee Pie. Tis the season, so we had to have pumpkin: Crunchy Caramel Nut Pumpkin Pie, Cinnamon Maple Pumpkin Pie, and Pumpkin Cheesecake Pie. Plus, there were outstanding unusual pies including Pear Bacon Pie with Pecan Blue Cheese Streusel, Key Lime Gimlet Pie and S’mores Pie. This was only the tip of the “pie-berg”. See the list of all the pies that came on my Pie Party Potluck LIVE! Parade Of Pies list. Oh My, The Sweet Pies | Pie Party Potluck LIVE! Beth - A Fall Pie Party Potluck in NYC! Pie Party Potluck LIVE! would not be possible without the generous support of our incredible sponsors. Our attendees got their first look at the new campus of the Institute of Culinary Education (ICE). They enjoyed an “Everything You Want To Know About Pie Making” demo with ICE instructor Sarah Chaminade assisted by Trevor and were wonderfully taken care of by the ICE crew. No one is allowed to eat the pie party pies until the bulk of the pies have arrived and the photos are taken, so sponsors provide treats to whet the attendees appetite for the pies. The King Arthur gals served apple cheddar pies all the way from Vermont. Nicole from Dub Pies served up mini pies for the fourth year in a row! Anolon partnered with Girl In The Little Red Kitchen’s Susan Palmer, who made cute beef and chorizo empanadas. The Institute of Culinary Education (ICE) crew made passed hors d’oeuvres—the macaroni and cheese bite was the fave— and whipped up a gorgeous cheese board featuring Cabot cheese. Attendees enjoyed checking out the new cooking and bakeware from Anolon. They were able to elegantly served their pies with Wüsthof cake-pie servers and they played with knives — just this once— on the Wüsthof display at the event. Many of the pie party patrons made their pies with King Arthur Flour as well as cheese and butter from Cabot Creamery. Everyone left with a fabulous gift bag filled with goodies from all of our sponsors and a basting brush from Tovolo Home, honey crème from Honeyridge Farm, Half Pops, the addictive half-popped popcorn, and flower based tea from Wild Hibiscus. We all enjoyed some fun and delish cocktails that Matt Bruck curated from Mizu Shochu, Tromba Tequila, and Reyka Vodka. BIG THANKS TO OUR VOLUNTEERS! Erica, Bernice, George, Thong, Mitch, and Trevor for helping to make this event seamless and organized! My biggest thanks go to my partner in pie, Ken Leung for always bringing it and helping to make this event a SMASH!!! A Whole 30 and gluten free compliant pie with a potato crust, pork carnitas, caramelized onions, roasted tomatoes, and eggs. 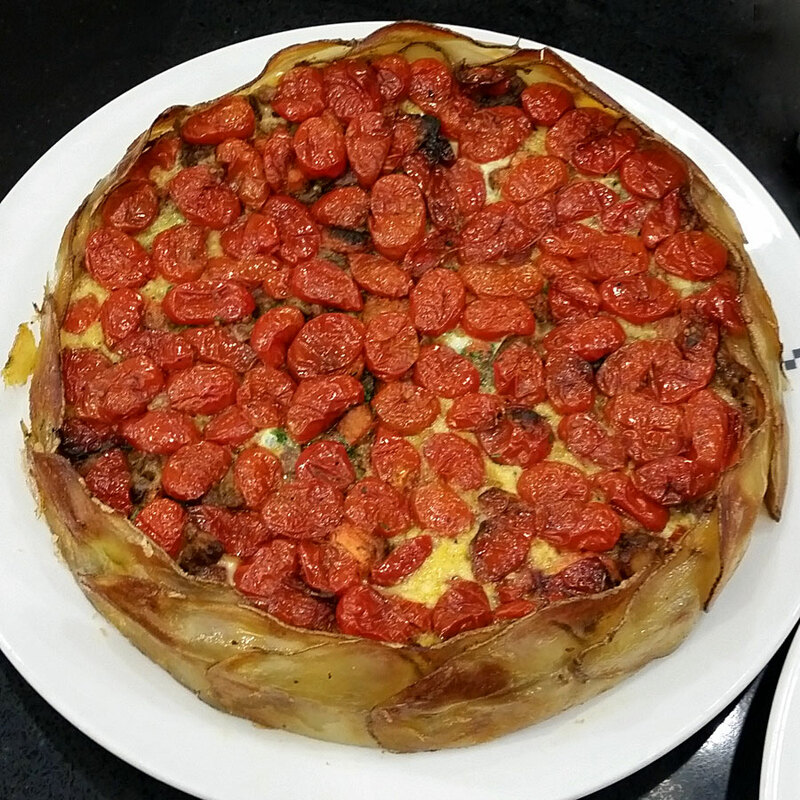 My idea was to take the ingredients of pork taco and make it into a pie or quiche with a layered potato crust. Toss the radishes with olive oil. sprinkle salt and pepper and place on a shallow sheet pan and roast for 20-30 minutes. Prepare the carrots the same way at the same time. Place pork carnitas in the potato crust, add radishes, carrots and onions. Beat the eggs well with the water or stock, add the cilantro and pour into potato crust. 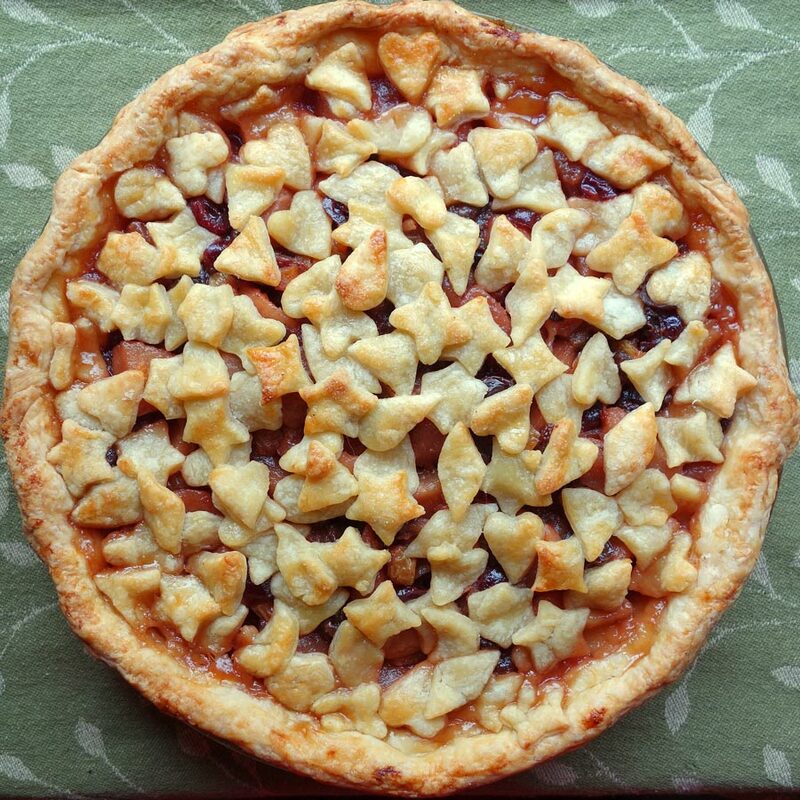 Arrange the tomatoes on top of the pie skin side up. Wrap the edge of the pie with aluminum foil to cover the edge of the potato crust. Bake for 45 minutes until the eggs are cooked. You can remove the foil to crisp the potato edge about 10 minutes before the pie is done. Cool for ten minutes. Gently and carefully lift the pie out of the pan using the parchment strips and place on a serving plate.